A.E. Waite's Devil-Worship in France, rather than being an infernal how-to book or even a history of what the title purports, is in fact an examination of a most sensational hoax perpetrated by Parisian journalist, Leo Taxil. Taxil and fictitious associate, Diana Vaughan, created a scandal in the late 1800s by reporting on a most heinous occult sect, the "Palladian Masons," that admitted women and performed diabolic acts of "Luciferian Spiritism." Taxil's "revelation" of this secret society and its supposed links to Freemasonry and other occult organizations, created a public hysteria and outcry against all things occult, especially secret societies. A.E. Waite's response, Devil-Worship in France, is his satirical and somewhat farcical interpretation of this sensationalization and persecution of occult groups in France at that time. This work, along with similar refutations by French occultist Papus, raised questions Taxil could not answer, and he was forced to admit that the reports were a hoax meant to ridicule both the Catholic Church and Freemasonry. This republication of Devil-Worship in France is the first reprint of the book in nearly one hundred years. A.E. 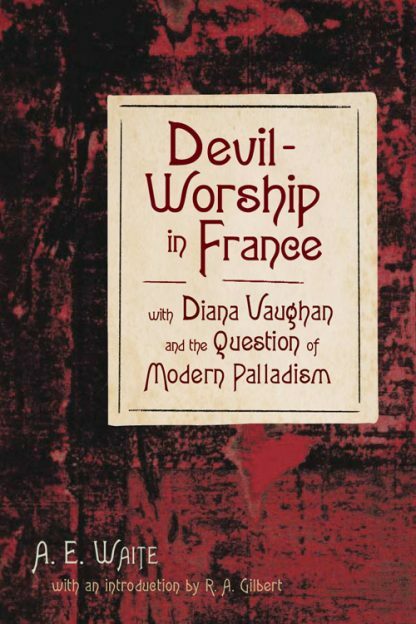 Waite then wrote Diana Vaughan and the Question of Modern Palladism, the sequel to Devil-Worship in France, where he reexamined and re-presented the telling of the hoax in a straightforward manner- without the satire and farce. Published for the first time, here, finally, is the whole story behind the hoax that slandered occult communities throughout Europe in the late 1800s. R.A. Gilbert's introduction places the book in historical and contemporary context.